I bring news from the Cotswolds, where the Beckhams are building a new £6m country house to replace their previous £11m country house in Hertfordshire. Although it’s not the house but the garden we’re concerned about today. They’ve recently lodged planning permission with the West Oxfordshire District Council so we know they’re not just thinking a bit of wisteria and a rhododendron. Instead, the Beckham’s new garden will have 23 kinds of tree (including apple, pear and plum), not one but two vegetable patches, an inner and an outer garden (whatever they are – sound like bellybuttons to me), and a ‘natural’ swimming pool. Plus, and this is my favourite detail of all, a 60-ft croquet lawn. Presumably now that David’s retired from one ball game, he wants to have a crack at another. It is thrilling news. Croquet has long been due a renaissance and the timing is perfect because look at what’s happening with other grass-based games. Golf? It’s taken something of a PR hit since Donald Trump became president. Tennis? Rows about doping within the sport rumble on with the release of Maria Sharapova’s new book. Cricket? The British players apparently can’t control themselves and, although I learned what an over was once, I’ve forgotten it again. So that’s out too. Croquet’s the obvious answer. You don’t get players suspended for taking the wrong ‘diabetes medicine’ within the genteel world of croquet. You get cucumber sandwiches, a slow potter around someone’s lawn and the satisfying thwack of the blue ball against the red ball as you send you brother’s ball hurtling off into the long grass. 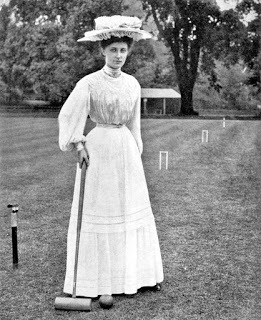 Such was its popularity that croquet was a sport at the 1900 Olympics in Paris, the first Olympic sport which women were allowed to play. The French won all the medals but, to be fair, that’s because they were the only ones who entered. Trouble was then lawn tennis came along and everyone decided they preferred that. So croquet’s star waned and it became the sort of game that you play on a Sunday afternoon at a friend’s house as a slight joke. And yet it turns out certain pockets of this country are rife with mallet activity. Just hop on to the British Croquet Association website (Patron: HM The Queen who, incidentally, first clapped eyes on her future husband over a game of croquet, at Dartmouth Naval College when she was 13). Last weekend alone, according to this excellent website, Surbiton beat Bristol 4-3 and Pendle & Craven absolutely smashed Woking 5-2. This weekend there’s a tournament in Southport. The site has triumphant pictures of smiling players in whites holding aloft silverware. Who needs Wimbledon when you have ‘The President’s Cup’ in Hunstanton? So I for one am excited about David Beckham’s new and glorious sporting career. I just have one tip, which is for the Beckham family as a whole and it’s something I learned while playing a game as a teenager. There I was, about to croquet a sibling’s ball and send it into the undergrowth. I raised my mallet and brought it down as if I was Goliath having a knock-about on a croquet lawn, and I hit the ball, but I also hit the side of my bare foot. It was bruised for weeks. I watched with a grisly fascination as it went from deep purple to bluey green to a fading yellow. All of which means that my advice, Beckham family, is to invest in several pairs of diving boots and play in those.